Choosing a periodontist can be a challenging endeavor for patients. We understand that you have a number of options, and we encourage you to do your homework before settling on one practitioner. Most patients will not want a periodontist who immediately suggests a surgical intervention for gum disease. Dr. Karabin and Dr. Gottesman always start with the most conservative non-surgical treatment that is appropriate for the patient’s case. We will only move to more invasive interventions if those initial efforts are not successful. Keep in mind that in some severe or advanced cases, though, surgery may be the most effective option. Not only does this approach put patients at ease, it also can reduce the expense for treatment. Read our Mission Statement. A more experienced periodontist has seen a wider variety of cases and had more opportunities to complete various procedures, which typically translates to better treatment outcomes. Drs. Karabin and Gottesman have been practicing for a combined 40 years, and both practitioners also demonstrate a commitment to keeping updated on developments in the field through continuing education courses. Dr. Karabin and Dr. Gottesman are respected experts in periodontal care and have presented to national and international audiences and published articles in prestigious journals. Both periodontists are also diplomates of the American Board of Periodontology, an honor accorded to fewer than one percent of American dentists. Dr. Gottesman also is a fellow of the International College of Oral Implantologists and International Team for Implantology. Our office uses the latest in digital imaging technology to insure unparalleled accuracy in treatment. A good periodontist will have a modernized practice with access to all of the latest tools of the trade. 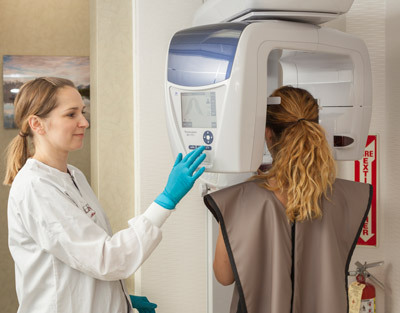 For example, our office has cone beam CT scanning technology, which offers three-dimensional images that are tremendously valuable in treatment planning for dental implants. We also utilize piezosurgery to preserve as much bone material as possible during dental extraction and grafting procedures without damaging surrounding soft tissues, gums and fragile sinus membranes. This is just a sampling of the modern technology available in our practice. Learn more about our technology. If you have any questions or need any additional information as you select a periodontist, please don’t hesitate to contact our office. We’d be happy to provide any information that will help with your decision. Why choose a periodontist for dental implant treatment? How does advanced technology affect my gum disease treatment?